This is the story about Debtor, a newborn American baby. Debtor has just been born into the greatest economy in the world, a land full of promises and opportunities. This is what his parents tell him. But unbeknown to Debtor, he has been given a very bad start in life. Because the parents haven’t told Debtor, and how could they since they are not aware themselves, that he starts life with a massive debt burden that will grow manifold during his lifetime. King Solomon’s words will ring true for almost every American born today. The average American is a debt slave already at birth. And by the time he dies, his debt will have increased exponentially, thus passing on an even bigger debt and greater enslavement to the next generation. For the majority of people it will be impossible to extricate themselves from this massive debt stone around their neck. Instead they will add to the debt by taking on more debt. But the government will also do their part. They will at least double the national debt every 8 years as they have been doing for several decades ( see last week’s article). 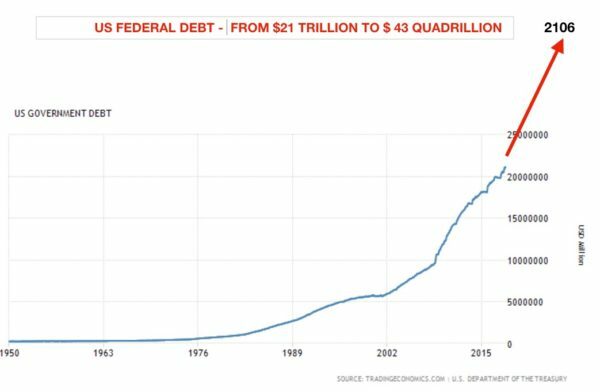 Starting from $21 trillion debt today and assuming that Debtor will live until 88 years old, a doubling of the debt every 8 years would lead to a $43 quadrillion federal debt in 2106. Most of us will of course not be around to check that forecast but since it is just an extrapolation of long term trends, it is difficult to argue with although a lot can of course happen in 88 years. Even the $43 quadrillion US debt in 2106 could be conservative. Higher deficits and higher interest rates, both being likely, could multiply the $43 quadrillion many, many times. I am sure that no one expected, in 1981 when Reagan started with a $900 billion debt, that the US debt would have gone up 23x to $21 trillion, 37 years later. No one likes forecasting the truth, because the truth looks horrific when it comes to all the mismanaged economies in the world. But the federal debt is of course only a smaller portion of the total debt and liabilities that Debtor and his fellow Americans are responsible for. The biggest burden will be the unfunded liabilities of Medicare and Social Security. Professor Laurence Kotlikoff has calculated that these amount to $220 trillion. That is 10x current federal debt and a liability that is unlikely to ever be funded. The best solution would of course be a miraculous increase in prosperity and tax revenues – Very unlikely. Another alternative would be that Debtor and his young friends spend all their working life just to pay the pension and medical costs of the older generation – Unlikely, plus it would lead to a revolution. More likely is that the government will just create more debt to pay for these commitments. We know of course that a debt problem will not be solved by incurring more debt and whatever additional money the government will create out of thin air will have zero value and therefore also zero effect. So that leaves the option that there will be virtually no medical care or pension for Debtor and his fellow Americans – This will lead to civil unrest as well as poverty, famine and disease. Not a very desirable outcome but sadly very likely. If we take the US population of 325 million, Debtor will be responsible for his share of all outstanding government debt and unfunded liabilities. That means 1/325 millionth of $21 trillion or $65,000 of debt is what Debtor starts off with as a baby. He clearly didn’t deserve that and nor can or will he ever repay it. The government never told Debtor’s parents that it always spent more money than it had and that this eventually would lead to misery for the US and for virtually every American. The government could of course not tell Debtor’s parents and the US people that it totally mismanaged the economy. The principal aim of the US government (as well as most governments) is to be reelected. And the best way to achieve that is to buy votes by bribing the people. But this has been a costly affair since the US government has not been able to make ends meet since 1960. Thus for almost 60 years, the US government has spent more money than it has collected from tax payers in order to buy votes. Once the newborn Debtor comes of age he will of course argue that he didn’t incur the debts and liabilities and therefore he will refuse to pay them. It obviously doesn’t matter if he refuses or not as he is not in a position to even pay the interest on the liabilities. In addition to his inherited debts, Debtor will during his lifetime continue to incur all the debts that every US citizen does. These will include credit card debt as well as student, car and mortgage loans. 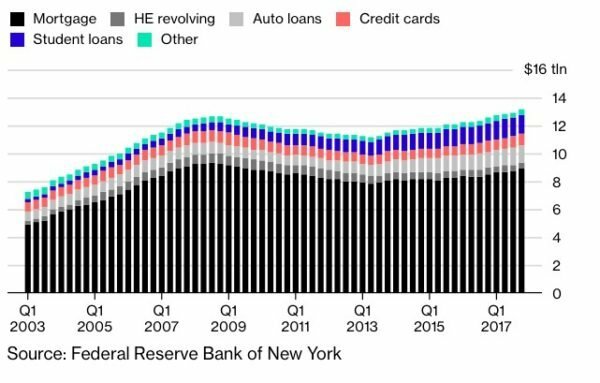 As the chart below shows, these debts have gone from just over $7 trillion in 2003 to almost $14 trillion today. During Debtor’s lifetime total consumer loans will grow from $14 trillion today to $100s of trillions. Debtor will of course have no ability to repay his loans and nor will any of his fellow US citizens. Many debts are likely to be forgiven by the government. What most people don’t understand is that their government can’t just wave their magic wand and forgive or write off debts without consequences. Someone will always have to take the pain of making debts disappear whether it is savers, pension funds or other investors. On the other side of a debt is an asset which will decline in value proportionately to the debt. So when debts disappear, whether it is by defaults or write offs, there will simultaneously be an implosion of asset values. According to Kotlikoff it isn’t coming from anywhere. When he recently commented on Trump’s tax bill, he stated: The US is dead broke. This leaves a fiscal Sword of Damocles hanging over our children’s economic futures. So what is the solution? Well there isn’t any. The US, together with many countries in the world, is leading its people to perdition. This will include massive debt defaults and a deflationary implosion of most asset values. But before that, governments will separately try to save their economies by printing unlimited amounts of worthless money. This will of course not save the economy but instead lead to hyperinflation and collapsing currencies. What will happen to Debtor who was unlucky to be born at the top of the biggest economic bubble in global history? The good thing for Debtor is that all his debts together with the country’s debts will disappear in a black hole. So will also his savings and investments but he is unlikely to have any. So Debtor will have a tough start in life. Hopefully during his 88 years, he will have a chance to rebuild his finances. Just imagine if his parents had just a little bit of foresight and gave him some gold. Even a small amount would make a very significant difference to his life.